Last April, Metrocurean told you about Palette chef Arnel Esposo being called up for service in Iraq. I'm pleased to report that he's home and got back into the kitchen June 9. 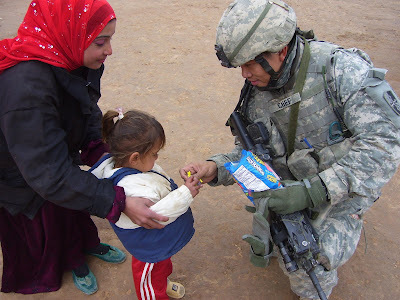 The chef, pictured above in an Iraq village, was a big hit with local kids thanks to the candy and chips he'd bring along. In his absence, the children would chant "we want the chef," according to a rep for the restaurant. Note that his name tag reads "chef." During the year of service, Esposo's Maryland National Guard unit enjoyed an abundance of Old Bay seasoning, thanks to a care package they received from the company. Esposo said it's good in moderation on potato chips, rice and soup. The chef may create a tastier version of MREs (meals, ready-to-eat) for Palette's bar menu later this summer. Stay tuned.